Natural stone cladding is done by arranging uniform sized and same colored natural stone tiles in horizontal or vertical manner on the wall. It enhances the beauty of a place. Cladding gives an ethnic earthy feel to the eyes. Many houses in urban world adapt to wall cladding. The low maintenance cost factor appeals to urban customer. Sandstone: In todaya€™s time, sandstone is perfect for wall cladding due to its properties like fine grained, compact, hard, possesses good compressive strength and minimal absorption property. Sandstone is available in different colors and in different shades. It changes the look of a wall and is preferred by interior designers. Interior designers work to provide something extra and ethnic to a place. 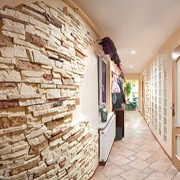 Natural stone wall cladding is the right method to reduce maintenance cost and enhance performance and looks. Limestone: It is quite inexpensive and highly durable in performance. Limestone is used to enhance the interiors through proper wall cladding. Rich earthy colors, varying texture and designs have an eternal effect on the interiors of homes. Hundreds of years old walls are seen with same elegance and essence in forts and monuments. Timeless unique and antique look is maintained with perfection through limestone. Slate: Slate is unfading and non-absorptive. Its stain-resistant quality makes it an excellent choice for young couples with small kids. Wall cladding with slate enables people to use the wall with rough-tough attitude. Slate-clad walls have different thickness, sizes and colors to suit customer needs. Walls may have varying finishes like textured, natural finish, honed and several others. Granite: Stone wall cladding is a costly affair with granite. Different colors like black, grey, pink, red, blue and more. Granite is a highly stable stone. It resists any thermal pressure on it and stands with same vigor and valor at all temperature as and weather conditions. Granite is rarely used in wall cladding due to price-factor. Black granite walls are rarely seen as these are extremely expensive. Grey granite is used to give an elegant and ethnic finish. Ancient Indian monuments have natural stone cladding with marble. Walls are generally white in color. Purity and durability are displayed in abundance. Value of home is enhanced manifold with marble wall cladding. This stone adds stately charm to exteriors and home interiors. It creates different atmosphere through its walls. It is almost non-depreciating and is known as both a€?king of stonea€? and a€?stone of kingsa€? a€” affordable only to a select few. Marble has maintained its richness over the centuries and will continue to do so for centuries ahead. Wall cladding application is time consuming and authentic. House owners relish the facility and charm provided through stone cladding suppliers. They understand the usersa€™ demand and decide upon the total budget for customer as per the area provided and choice of stone. It is right to say that stone industry is picking-up once again as people have started realizing the value and importance of natural stone. They want least efforts and maximum benefits. Interior designers use these to enhance value and reduce maintenance cost.